File photo of a Beechcraft Super King Air 200. The Irish Air Corps' model is being sold off after 29 years of duty. THE IRISH GOVERNMENT is inviting interested parties to submit bids to buy its former ministerial plane – but can’t offer any guarantee that the aircraft can still actually fly. 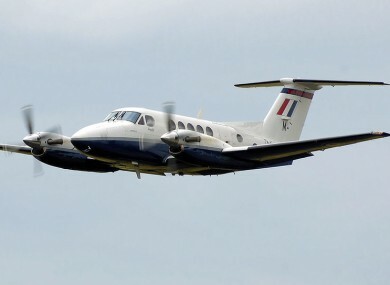 The Department of Defence has put out a tender seeking to dispose of a Beechcraft Super King Air 200, which has been on the books of the Irish Air Corps since it was built in 1980. Having been regularly used to ferry ministers across the country and beyond since then, the aircraft – which carries six passengers and two pilots – was effectively retired in 2009 as the government made use of its other Gulfstream and Learjet aircraft. The plane has remained at Casement Aerodrome in Baldonnell ever since, taking a well-earned rest after clocking up a total flight time of 16,132 hours in its 29-year service. “The aircraft and spare parts are being sold as a single lot and on an “as seen” basis,” the Department’s tender document says. There is only a small market for such secondhand craft so it is not clear how much the government may expect to make from the auction of the aircraft. New models of the plane sell for between €4m and €5.5m. Earlier this year Alan Shatter appeared to reverse government plans to dispose of one of its two current government jets, despite plans left by the previous government that the older Gulfstream craft would be phased out of service. Email “Government to sell 32-year-old plane... which might not fly any more”. Feedback on “Government to sell 32-year-old plane... which might not fly any more”.